Don’t be scared by the name of this post. Although there’s actually more vegetables than fruit in this bowl, you’d never know it based on how delicious it is. I wanted to make a healthy smoothie bowl to highlight the Collagen Beauty Greens by Vital Proteins, but I knew if I threw a bunch of greens in, I would likely have the same result. 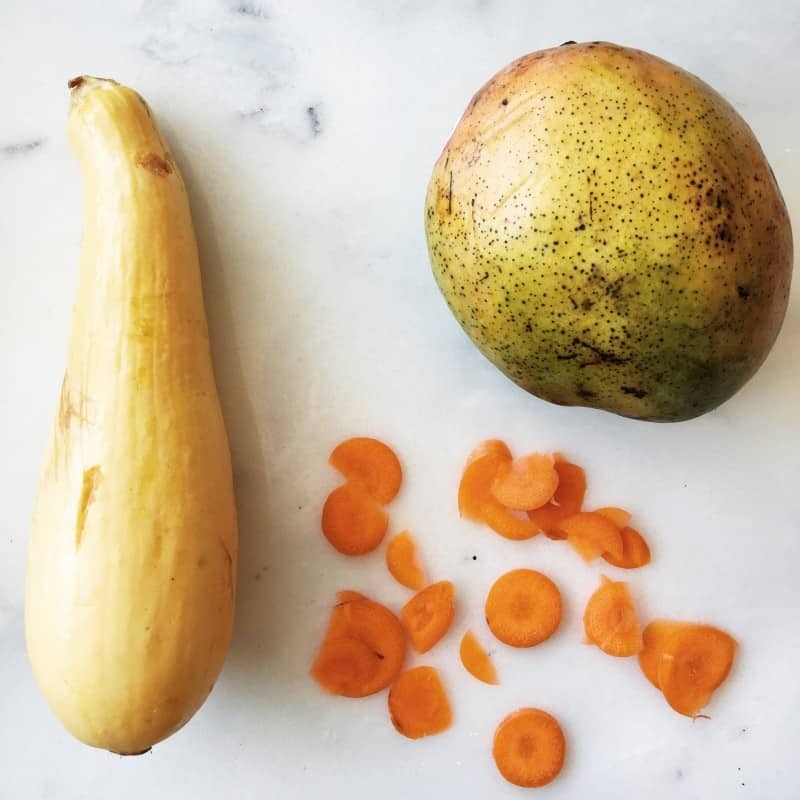 I chose fruits and vegetables that were in the same color family and especially vegetables that had a mild taste since I wanted the fruit to come through: yellow squash, carrots, and mango. Yes, this smoothie bowl contains an entire squash and several carrots and you would have no idea when eating it. MASTER OF DISGUISE. 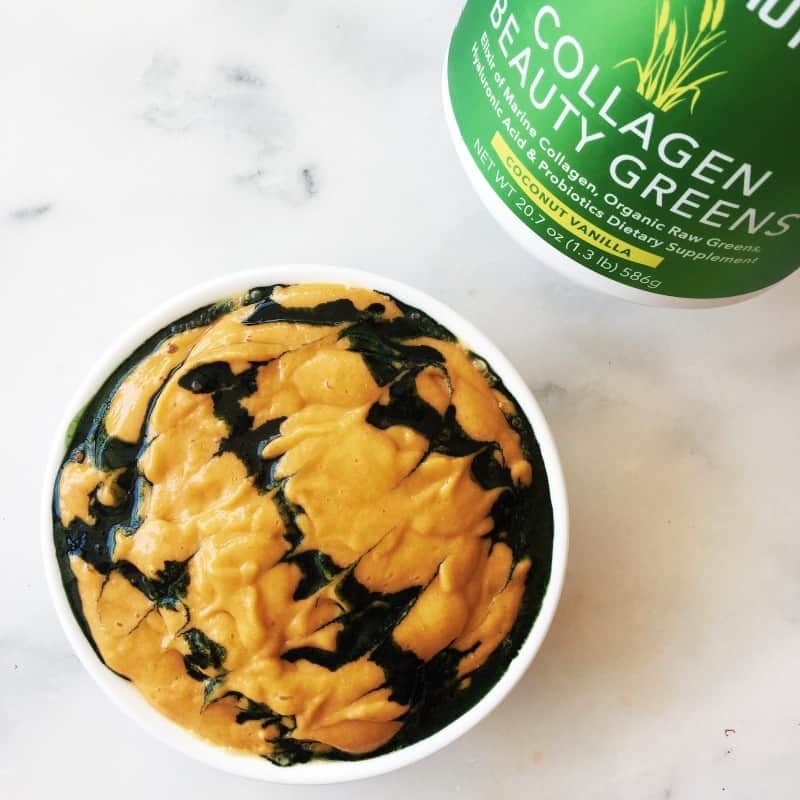 The collagen was combined with other ingredients in these Beauty Greens to predominantly help improve the quality of your skin — smoothness, tone, moisture, elasticity, etc. It’s been about three months now that I’ve been consistently using products from Vital Proteins and I really like each and every one that I’ve tried. They’re extremely versatile and a great addition to my daily routine. NOW MAKE THIS SMOOTHIE BOWL. 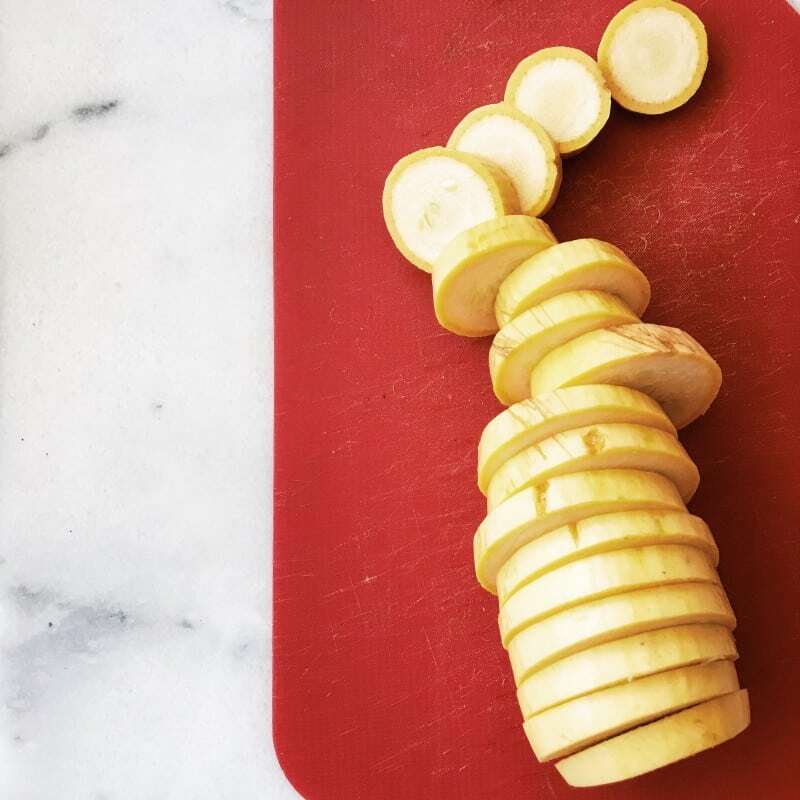 Cut squash, mango, and carrots into smaller pieces. This is just so that they blend easier. Add all ingredients to blender in this order: chia seeds and Beauty Greens, fruits/veggies, water, ice. Blend on high until desired consistency is reached. You can add more water if you’d like a thinner smoothie bowl. * I added the Collagen Beauty Greens (mixed with a bit of water) after making the bowl so that it would photograph well. Normally I would just add it all and chow down. It’s your decision how fancy you’re feeling. ** You can also use another fruit if you’re not a fan of mango. I would try peach, banana, or pineapple if you’re looking to mix it up. What’s your favorite type of smoothie? Hahaha right?? This is the perfect solution! 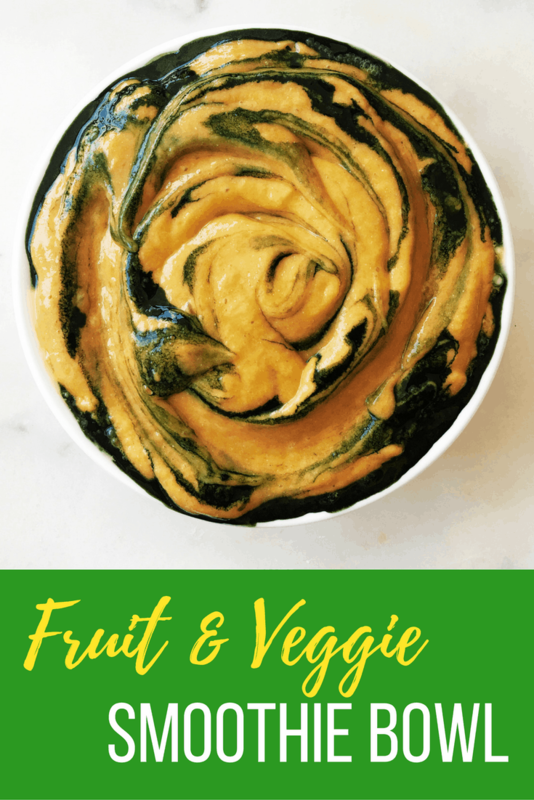 I know first hand just how good zucchini is in a smoothie after you told me so I am trusting you with this and assuming this is awesome like you! I need to work on my smoothie color palette too. Mine always turn weirdly grey/brown! hahaha they taste good though! Heather @ Polyglot Jot recently posted…WIAW Eating Often! Yum!! I wish my smoothie bowls turned out that pretty! This sounds delicious! I’ve definitely added sweet potato to smoothies before – super tasty. I like sneaking in zucchini to oatless-oatmeal in the morning or greens in my smoothies. Usually I’ll just eat a big salad for lunch, veggies and dip for snacks, and trying to prepare veg in different ways for dinner! I’ve seen adding zucchini to oatmeal but haven’t tried it yet. I need to get on that! The only veggies I put into smoothies is either spinach or kale. SQUASH?! Giiiirl that’s awesome! Yeah man you can’t even taste it! WOW. I would not have imagined this Erin; that was such a wonderful idea to pop the squash and carrots in there. I have carrots and squash, but I don’t have mangos. Maybe I could try peaches? I originally wanted to do peaches but I couldn’t find any that were ripe. I’d totally go for it! Your smoothie bowl is so pretty! Haha the swirl part was created on accident when I went to eat it. Then I was like hey I like that! Several steamed carrots went into mine today also. Tons of kale too, since it is not lasting as long as it usually does. I used a whole onion as well! Nothing is off limits and usually consists of veggies that were on sale (meaning I bought too much!) and need to be eaten pronto. Always nutritious though and fills me up. An onion?! Now that’s bravery!